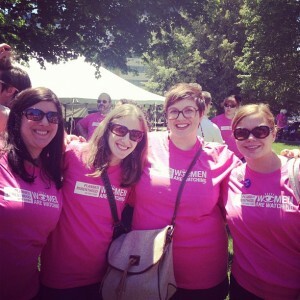 Women are watching …AND WE VOTE! Yesterday, I had the opportunity to bike down to the State Capitol and participate in a protest against House Bills 5711-5712-5713, known to most as the Super-Anti-Abortion legislation being catapaulted through state government at unusually rapid speed. The sea of pink beginning to form on the Capitol lawn. What is even more troubling, in my humble opinion, than the fact that this extreme measure directly in opposition to women’s health is being taken in our state, is the fact that this package of bills (introduced to the House Committe on Health Policy by Representatives Rendon, Shaughnessy, and Franz, just two weeks prior to the vote on Thursday, June 7th) was not given the opportunity to be commented on by women- the very group of people it will effect. That’s right- women were not given the opportunity to testify for or against these bills! Rather, the Republican led legislature is taking matters into their own hands and deciding the fate of Michigander women. In summary, this package of bills leads to physicians being mandated to be present for medication abortions, to screen women for “coercion” before providing an abortion-esentially playing the role of an investigator AND doctor- and the legislation would create new regulations for the disposal of fetal remains. In addition, the measures would ban “telemedicine” abortions, which is the use of technology to prescribe medication for abortion services and the morning-after pill, which is essential in terms of access issues for women in rural areas or of lower socioeconomic status. The result of yesterday’s planned vote was that it was delayed, and is expected to be debated/voted upon at some point today (Wednesday, June 13th). While there is much speculation from pro-choice groups as to why this vote was delayed (mainly that the GOP led House was scared to take on a vote with so many supporters of women’s choice being present! ), the fact of the matter is that there is still time to make your voice heard! If you are interested in stating oppostion to these measures, visit the Planned Parenthood Advocates of Michigan and take action on this by donating, reading up on the specifics of this legislation, or becoming a volunteer! You can also call your representative and/or House Speaker Jase Bolger and let them know that you stand in opposition to this harmful package of bills. As constituents, we expect that our represtatives will vote the way we want, but how do they know what we want if we are not vocal!? To find your local repreentative and their phone number/email, look here. Lastly, there will be additional protests at the Capitol until the legislation is voted on! If you are available to stop by, please do! Check the facebook page for details on when/where to meet! UPDATE: Yesterday evening, Wednesday, the House passed one of the three extreme measures. HB 5711 was passed with a 70-39 vote, with 6 Democrats crossing party lines to cast their vote. While I am extremely saddened and disgusted with our “representatives” and the fact that their misogynistic morals are being cast upon women’s health, I stand firm in my belief that the slogan “women are watching…and we vote” will hold true come re-elections. Remember, the most important thing we can do as citizens is to vote. And we can still make our voices heard on this issue! Call/email the representatives who voted for this and express your disappointment, while thanking those who stood in opposition! Volunteer for Planned Parenthood Advocates of Michigan and on various election campaigns to ensure we get candidates elected to represent us that do not push their misogynistic agendas. Show up to the protest this afternoon! We can make a difference and while this is sad news right now, I believe we still have a chance to fight for our rights and see a positive outcome long term. 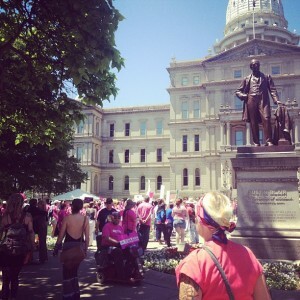 This entry was posted in City Life, Lansing Politics and tagged #feminism, #lovelansing, #politics, #protest, #reproductiverights, #womenAREwatching. Bookmark the permalink.